Planning an exhibition can be as easy as 1-2-3, but if your overall engagement and leads were low at previous exhibitions, it might be time to go right back to basics and review your existing stands branding and how it is perceived by your potential customers. You don’t necessarily need to choose the largest space available, but instead use the space you do have to its maximum. 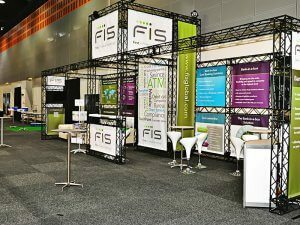 You could use the space above your stand – with some exhibitions, you should be able to build up to 4m without incurring the extra cost of a structural engineer, or for that extra bit of height, you can invest in rigged or hanging banners to attract customers from across the exhibition area too. Which customers are you aiming at? 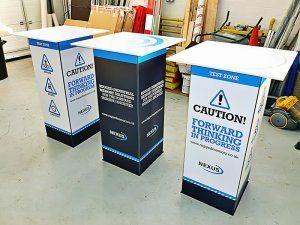 Decide on the type of customer or business you want to attract, and create simple but effective graphic stands to display particular products or services. If you have a wide range of products, use a few leaflets for customers to take away and for you to use as a talking point. This will also save money on leaflet production! 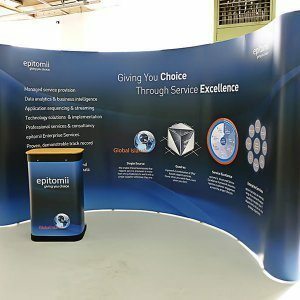 In planning for the longer term, you could also consider designing a stand which contains interchangeable graphic panels so that your company messaging could alter each time you attend an event (by only replacing sections of your content rather than the entire stand). Any furniture on your stand is perfect for creating social areas within your space, but be careful it doesn’t get too overcrowded. Here at Zoo, we offer product displays, shelving, lighting, business card holders and iPad holders as a few examples – we can help you decide which pieces of furniture would work best for your company stand and recommended for potential future events and exhibitions. You could create a presentation for your customers to scroll through, as well as collect customer data. By using iPads for example, you could use a branded iPad holder, or a custom pop up counter or plinth to hold your iPads. Extend the value by using the presentations inhouse within your reception area, customer area, communal TV area or website. Your overall look should look co-ordinated – make sure you use the same branding and style with all of your exhibition material, from flooring to graphics and brochures. 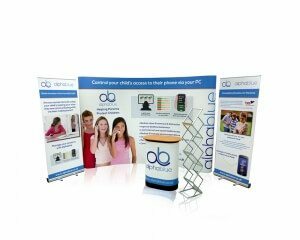 Create an impact with Zoo Signs and Design – we can assist you in all exhibition and promotional items – working from your initial ideas through to the finished products, stand design, displays, signage and also marketing material.